The Skrulls are about to get their moment in the spotlight on the big screen, with Captain Marvel heading into theatres this week. But in the comics, their latest mission is a little more down-to-earth — even if the fate of their entire civilisation is at stake. Although they’re primarily presented as villains throughout their comics history, there’s always been a tragic undercurrent to the Skrulls — a society ruled by paranoia and secrecy after their first encounter with the Kree eons ago kicked off an interstellar conflict that transformed them from peaceful intergalactic merchants to a savage empire that’s slowly been in decline ever since. 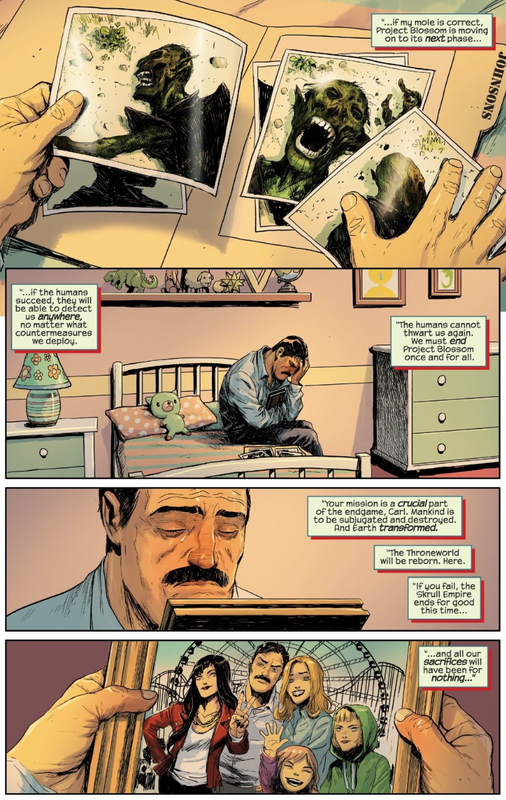 It’s that desperation and tragedy that has driven them to Earth time and time again, in the hopes of hiding among humanity and eventually taking the planet as their own — most famously in the iconic Skrull storyline Secret Invasion. But their latest trip to Earth in Robbie Thompson, Niko Henrichon, Laurent Grossat, and Travis Lanham’s new miniseries Meet the Skrulls feels more intimately desperate than ever — because it blends a mission to save the Skrull Empire with a whole mess of relatable familial strife...even if the family just so happens to be a group of green-skinned shapeshifters. So of course, those family dinners very suddenly become mission sitreps, and an opportunity to hold up a shape-shifting mirror to human society. There are interesting parallels between Meet the Skrulls’ first issue and The Vision, Tom King, Gabriel Hernandez-Walta, and Jordie Bellaire’s seminal series that put the Android Avenger in the heart of suburbia with a new family of fellow synthesizes. There’s a similar tension there in the clash between the extraordinary and the normal, as well as the personal drama that all families, alien or otherwise, go through. But while The Vision’s mirroring of humanity came out of a desire to understand and emulate it, Meet the Skrulls’ mirroring is about exploiting its darker tendencies. For some of the Warners that’s easier than others — Gloria and Madison recount how they’ve tapped managed to blend into their covers and play on everything from political blackmail to some casual school-cafeteria cruelty to worm their way closer to their intended targets and uncover Project Blossom. Political circles and the dog-eat-dog world of high school cliques are naturally places where sneaky, paranoid beings like the Skrulls can thrive, after all. But for Alice Warner in particular — whose infiltration mission is to become friends with a girl at her high school, who has instead become her bully — the inherent cruelty of teenage school life and her own civilisation’s desperation have become too hard to bear. 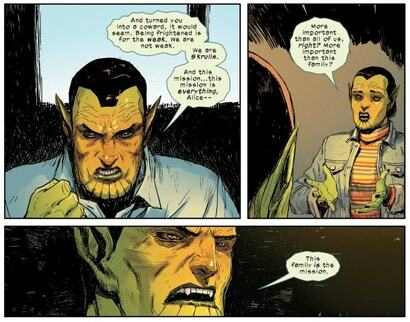 How can a young Skrull cope with not just the pressures of their own Empire’s decline, and the desperation that drives all that, but also the pressures of being a teenager on Earth? 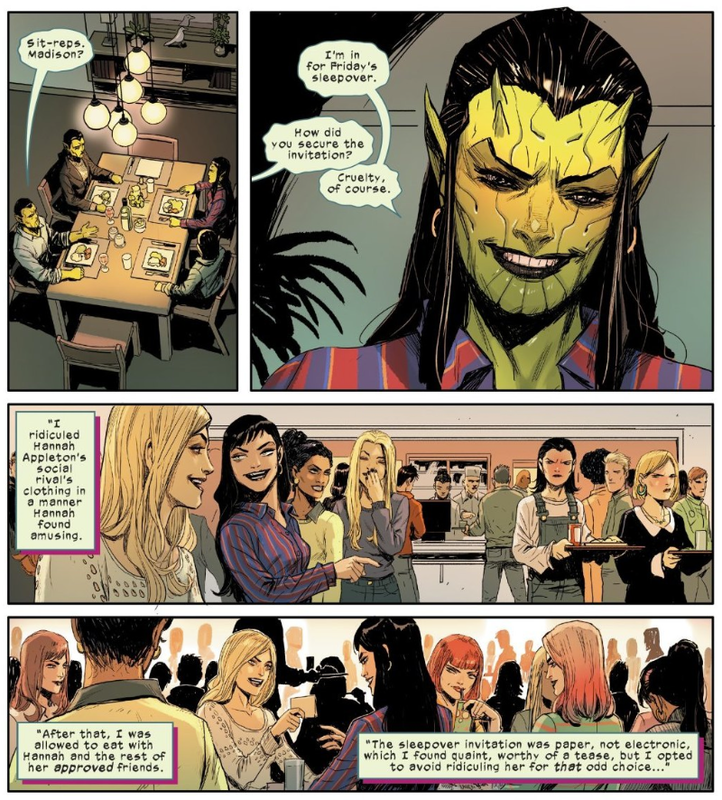 It’s here that Meet the Skrulls reveals the true tragedy behind the Warners’ plight, as Alice storms away from the dinner table with an outburst that she can never compare to an unseen “her” in the eyes of her father. The “her”, it turns out, is a younger sister, who we learn was killed by an unknown assassin roaming the Earth and targeting Skrull cells attempting to uncover Project Blossom. Which—it’s also revealed—is actually a piece of tech being developed by Earth and its mightiest heroes that would render the Skrulls’ shapeshifting abilities detectable wherever they are. Good for humanity, which doesn’t want a repeat of Secret Invasion on its hands ever again. Less good for the Skrulls, because it would basically seal the fate of their entire existence, if the one thing they can use to protect themselves is rendered impotent. And so, as Carl Warner is reminded at the issue’s end, regardless of what sacrifices his family has made—and the emotional toll it’s enacted on all of them — their mission has to succeed, no matter the cost. But even if the Warners do, they might not make it out in one piece, though whether it’s the stresses of family drama tearing them apart or the mysterious high-tech assassin that’ll get to them remains to be seen.